After a whole month of publishing and promoting tips almost every day, I thought I would offer something a little more fun. However, we still need to infuse some personality into our online presence and let our readers and fans know a little about us. 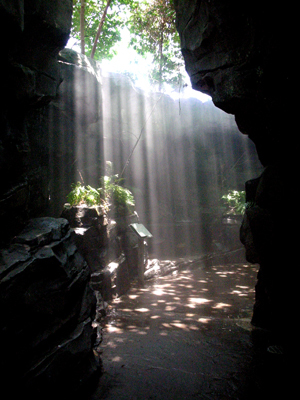 So, I am going to give you a little insight into Spunky’s world. I’m a total sucker for animated films and movies about animals. I really wish I could sing. I can hit the right pitch when playing Karaoke Revolution, but I sound awful. My husband is smarter and better at everything than me - except math. By the time he pulls out the calculator, I already have the answer in my head. When I develop an interest, I go all out. I don’t just love riding roller coasters - I know all the manufacturers, the parks, the record-setters, etc. I love black & white photography. It’s easier for me to see the world in B&W than color, as I am drawn to patterns, shapes, and textures. My husband is the hero of my life. What fun, personal things are you willing to share? I’d also like to thank Heather Gardner at The Waiting is the Hardest Part for giving me the Zombie Award. I will pass it on to my helpers, Spunky’s Soldiers: Laura Marcella, Sia McKye, Golden Eagle, Clarissa Draper, Jo Wake, Tyrean Martinson, Gwen Gardner, Ida Chiavaro, Randi Lee, and Nancy LaRhonda Johnson. I love hearing Spunky snippets! You've got so much passion for life and it's cool that you've always known what you wanted and planned to get it! I'm outspoken, and I always have been. Plus I write celebrity gossip as well as horror/paranormal. My world is not sunshine and roses, and I adore weirdoes! Depending on what a person writes will dictate what they can get away with. 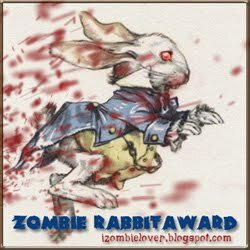 Thanks for the Zombie Rabbit Award, apart from displaying the badge, is there anything else we are supposed to do with it? I don't think there is anything about me that I haven't posted in my blog at one point or another. Love the tiger! I sleep with a bear named Bruno. Oh this is such a fun post, Diane. You and I are very similar height and weight, but I'm having so much fun shopping for clothes for the first time in my life. A fun fact - I can play spider solitaire for hours. Sigh! Nice to know more about you! Only one tiger? I admit, I have a tiger problem. I have a lot of them. Well, we're out of cake. We didn't expect such a rush. I always wonder if I reveal too much. Although the posts I where I do reveal, I get the most responses. Fun post! It's nice to learn more about you. :) Congrats on the award! Elizabeth, that sounds like a lot of fun! Jolie, I can be very blunt and I've had to learn to tame that. Rhonda, glad you enjoyed them. Jo, I don't think there are any requirements with this one. Karen, it's just so difficult to find the small sizes here. Heather - LOL! You know your Eddie. Em-Musing, that might be telling you something. I'm also a sucker for romantic comedies. I love blogs that are more than hops and promotions but contain content information about the writer-- who they are, what they like, a little about their journey. This to me speaks "branding" more than any cover reveal will. I didn't show my picture on my blog for a good 5 years. Then I decided to pursue writing "for real," so I had to show myself. I curse a lot in real life, and it does slip on my blog every once in awhile. Guess I should watch that. Excellent advice and worth a Tweet! Great example with the roller coasters! For me, its not enough to know about wormholes. I need to know what the leading theoretical physicists are saying. What are the top research centers. What do they expect on the immediate horizon. What are their greatest failures. That's research. And its great to know you a little better. Thank you so much for the award! I don't know what to say about myself. I always wanted to go to university but I had trouble narrowing down what I wanted to do with my life. Doctor? Architect? Fashion designer? All I know is I never wanted to be a writer. Although I've always had worlds in my head, I never though I could write with my poor grammar skills. I enjoyed the personal tidbits. it is nice getting to know someone through their blog. Let's see...I'm the world's worse (best?) procrastinator. Even for things I like, I have a terrible time getting past the inertia. Once I get started, I'm the energizer bunny - I don't want to stop. Which is good because if I do I'm back to the whole inertia thing again. David, love animated films! They are so cute. Johanna, you are even more Elfin than I am. Clarissa, that's why we have Spellcheck and editors. LD, I tease my husband that he's the master procrastinator. I love animated films and black and white photography. My hero in the latter is Stenglitz. Now this is very personal and true: I'm 5'1" so I can see over counters. I weigh in at 100-103 depending on how many hot fudge sundaes I consume. I rescued a Teddy Bear from a thrift store once and counted it as a good deed. A cat named Nini usually sleeps with me. She purrs a lot. I tend to go all out when I'm interested in something, too. That's great that you knew what you wanted at age 14. I'm not a roller coaster fan. Congratulations on the award and all your accomplishments in writing -- all those books! I also love writing and photography. Neither of those were goals I set, but just happened to me in a natural kind of way. I'm happy to have met you in person and hope we meet again sometime. Thanks for sharing the tidbits! As I already knew, we're a lot alike. I understand the B&W thing, because I love different patterns and textures, but I've always been drawn to bright colors. Some great tidbits. I find it most interesting that you kept four life goals that you set for yourself at the age of fourteen. My hubby is like that, too. Me, at fourteen, I thought I'd be a great medical humanitarian traveling the world on the Good Ship Hope, or would adopt at least a dozen children, and then write the next great American novel. Never been on a ship, and didn't adopt any children, but we used to have a canoe, and we're expecting our thirteenth grandchild. Kinda the same, but different, right? Yikes! Hubs must be special if he can get away with recommending a clothing line called Elfin! Thanks for sharing the very interesting insights into Spunky's World. Fun answers! I also think it's good to be personal, as long as one isn't mean, stupid or nasty. I loved learning more about you. I'm a reserved person, but I do get personal in social media. I think you're right. People who read our blogs want to know us, the real us. At least that's true of me. When I got to blog, I don't mind the occasional book reviews, but for the most part, I want to meet a person. I really enjoyed getting to know you better today. Love the snippets from your life! I agree that we need to be careful, and at the same time we need to be a little personal. Mel, Eddie Izzard is funny. C, Lee, you understand my dilemma then. And my B&W hero is Adams. Mary, I have one of those. too. Her name is Rocko. Freeda, maybe on our next trip to Arkansas. James, he gets away with it because he says short is cute. Nutschell, I've about worn the fur off the poor thing. How fun! I'm amazed by people who know what they want early in life. I'm from the pinball side of the equation. Very nice snippets into your life. I got kind of a sense about you... maybe a bit looney - learning so much about something because you enjoy it. That doesn't kill any of the mystery of the thrill for you? Hi Diane .. well I'm in awe if you managed to know what you wanted to do at 14 .. I'm still waiting - but I guess now it's writing, surprises me too. Also your knowledge of rollercoasters - definitely not on my list - the stats and info might be .. but riding them, oh no! Eddie Izzard .. Mrs - well you are small and that would fit his Neanderthal beginnings ... I don't think you spotted my two posts on his DNA markers back to Africa - I wrote in March? I definitely won't admit to sleeping with a tiger body pillow - regrettably on that score ... I'm rather dull I think. I didn't get a chance to read all of your April blog posts, but I found the tips helpful from the ones I did read. Bravo...on all you have accomplished! I want to teach art and I'm going to go pimp myself out next week. I have been known to take dares and do them...coasters, poetry and diving boards, for example-lol. Fun post and I love how your husband is so encouraging-so sweet!!! Hello everyone! I'm sorry, I had a rush formatting job yesterday and wasn't online. I will catch up today. Nancy, that is very true. Hilary, I think I saw one of those posts. Ella, I can't wait to hear it. Your tiger is so cute! It's nice to learn a little more about you. Of course, you sing with your words. 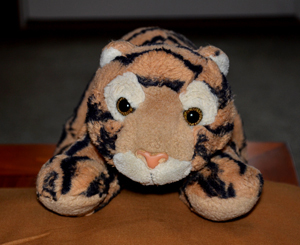 Neat stuffed Tiger. I'm going to see if Eddie Izzard will move to America. Well done on getting that Zombie Rabbit Award from Stormy, um Heather. Yay for your Spunky Soldiers! That's hilarious that your stuffed tiger is named after Eddie Izzard! I bet he'd be flattered, ha!